Chia seeds are a favorite superfood! The word Chia comes from the Mayan language and means “Strength.” I’ll say strength is what this power food offers on all levels. Recent reports show that after taking chia seeds for a few weeks, arthritis sufferers reported decrease symptoms. The high concentration of Omega-3 helps to lubricate the joints similar to fish oil. The Omega-3’s are converted to prostaglandins in the body which have anti-inflammatory qualities. Another advantage is in the detox area. Chia has a swelling action in the colon similar to psyllium which absorbs toxins. Thus, it regulates bowels and cleanses the colon. The seeds are loaded with antioxidants to fight that free radical cousin Joe. (see previous post -Free Radicals) They contain 20% protein which is a higher percent then wheat or rice for all you that ask how to get good protein without eating a ton of meat. 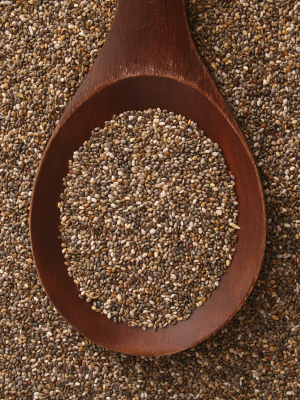 Chia helps stabilize blood sugar and provides fiber, zinc, and phosphorus! It’s a winner on all levels!! !